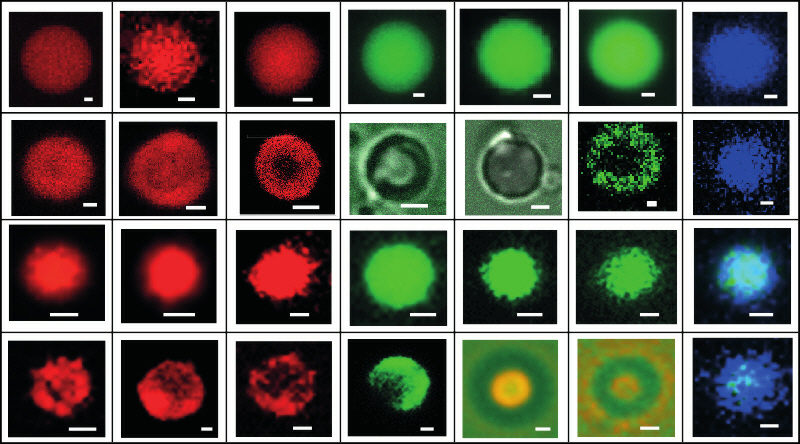 Although coacervate micro-droplets can be stabilized by excess surface charge, under many conditions they exhibit a propensity to coalesce into larger droplets or undergo macroscopic phase separation. As a consequence, their use as a protocell model can be compromised by their liquid-like behaviour and low surface tension. To circumvent this problem, and to generate a new type of hybrid protocell, we have recently developed several methods to produce membrane-bounded coacervate micro-droplets via spontaneous assembly or partitioning of auxiliary components on the surface of the liquid micro-compartments. T-Y D.Tang, C.R.C. Hak, A.J. Thompson, M.K. Kuimova, D.S. Williams, A.W. Perriman and S. Mann, Nature Chemistry, 2014, 6, 527-533. We are exploring the use of simple physical and chemical processes to generate new types of hybrid protocells based on the spontaneous self-assembly of a continuous fatty acid multilamellar membrane at the surface of preformed coacervate microdroplets that comprise molecularly crowded interiors. The approach integrates notions of membrane-mediated compartmentalization, chemical enrichment and internalized structuration, and brings together alternative models of prebiotic compartmentalization based on either phase separated liquid droplets or fatty acid vesicle self-assembly. Our studies indicate that the membrane-enclosed coacervate micro-compartments are semipermeable and exhibit uptake and exclusion properties different to those of the uncoated microdroplets. Thus, it should be possible to exploit the hybrid protocell model to develop transmembrane control of coacervate-sequestered reaction systems such as gene-directed protein synthesis or RNA catalysis by diffusion-limited regulation of the uptake of small molecules from the external continuous aqueous phase. Our investigations show that the anionic fluorescent dye 8-anilionapthalene sulphonate (ANS) can be readily sequestered into the interior of positively charged oligolysine/ATP coacervate micro-droplets to produce a dispersed microphase that exhibits increased morphological stability and complex internal structuration. The uptake of ANS into oligolysine/ATP coacervate microdroplets occurs initially in the outer regions of the droplets, and is associated with a progressive reduction in the zeta potential of the dispersion due to formation of loosely associated ANS/oligolysine/ATP complexes that retain the polar environment and dynamical fluctuations of the native peptide/nucleotide matrix. Tang T-Y D, Antognozzi M, Vicary J A, Perriman A W and Mann S, Soft Matter, 2013, 9, 7647-7656. D.S. Williams , A.J. Patil , and S. Mann, Small, 2014, 10, 1830–1840. We are also interested in developing hybrid protocells that consist of coacervate micro-droplets enclosed within an inorganic-based membrane. 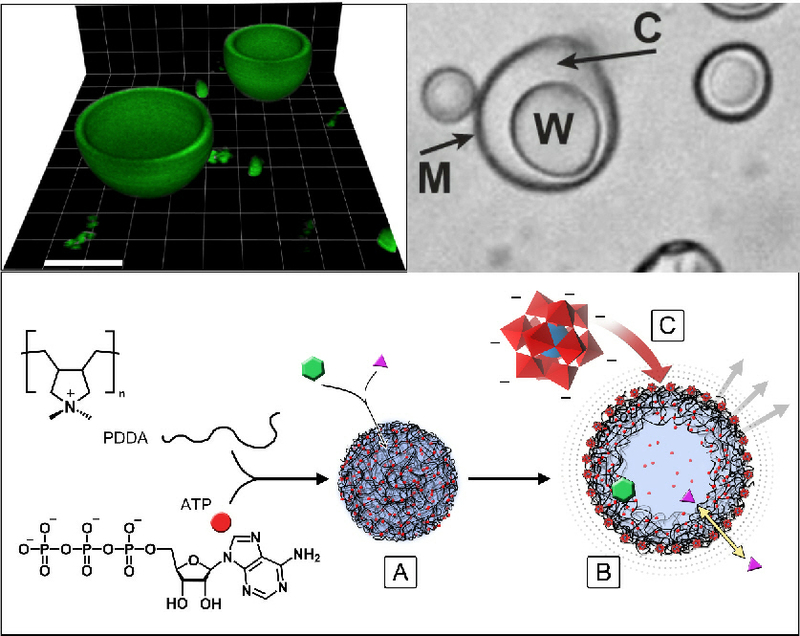 Recently, we demonstrated that molecularly crowded polyelectrolyte/ATP-enriched coacervate droplets can be transformed into membrane-bounded vesicles by using a polyoxometalate-mediated surface-templating procedure. 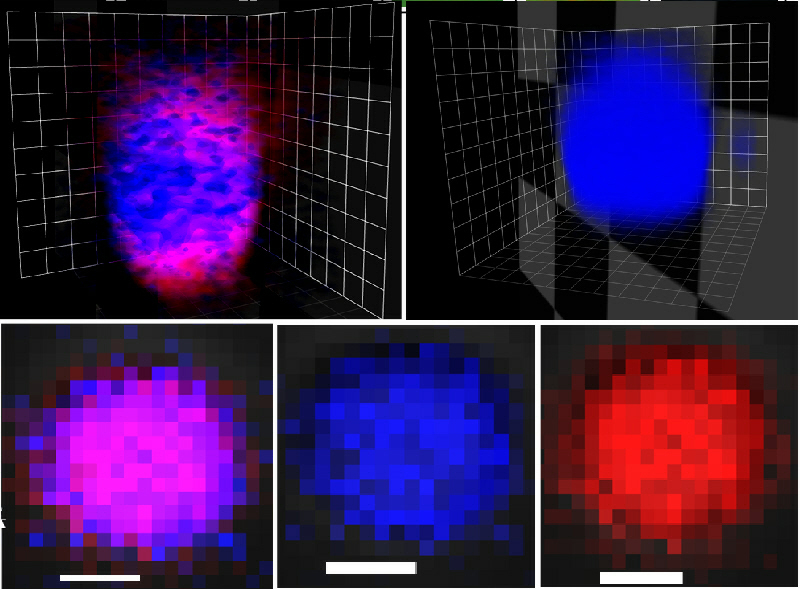 The coacervate to vesicle transition results in spontaneous structuration of the coacervate micro-droplets into novel three-tiered micro-compartments comprising a semi-permeable negatively charged polyoxometalate/polyelectrolyte outer membrane typically 600 nm in thickness, a 2–5 μm-wide sub-membrane coacervate shell capable of sequestering organic dyes, proteins and nanoparticles, and an internal aqueous lumen often tens of micrometres in diameter. The encapsulated proteins are inaccessible to proteases in the external medium, and can be exploited for the spatial localization and coupling of enzyme cascade reactions that are generated within single or between multiple populations of the coacervate vesicles. In particular, by locating different enzymes in different protocell populations, we produce enclosed reaction compartments that can communicate chemically at a distance, provided that the reaction intermediates can diffuse across the boundary membrane.